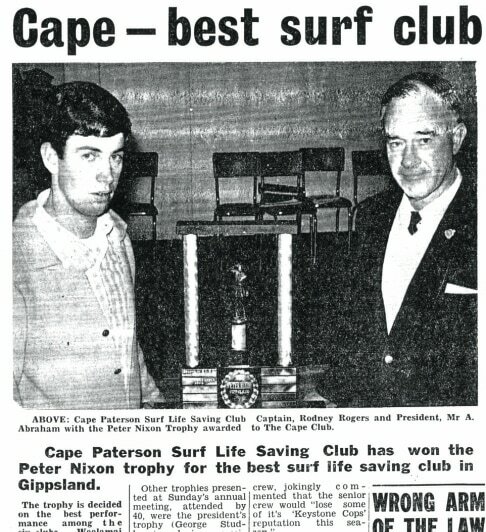 The Cape Paterson Surf Life Saving Club was formed at a public meeting in the Wonthaggi RSL Clubrooms on 22 March 1960 and became affiliated with SLSA on 20 April 1960. There was, and still is, a Royal Life Saving Club (Wonthaggi) about a kilometre from the first surf beach. As a real estate firm was developing the area, a road was formed to the surf beach. Clinton Shiells, an ex Torquay club captain and who was the Bass District Supervisor at the time, had taken a teaching position in Wonthaggi and realising the growing interest in surfing suggested a surf life saving club should be formed at the surf beach. He persuaded some senior members of the Wonthaggi Royal Life Saving Club, notably Messrs. Ron Gilmour, Less Legg, Allan Birt to consider forming a Surf Life Saving Club – a move not completely popular with the Royal Club due to the possibility of losing members but, after a meeting on the sand dunes, led to the inaugural meeting at the RSL. Mr Wally Purvis, of the well known Gippsland building firm, was elected the first President, Ron Gilmour the first Club Captain, Les Legg the first Boat Captain and Allan Birt to the Committee. Les was also the first Club Captain. The first clubhouse, a 3 metre by 10 metre fibro shed, was built near the site of the present boat ramp by the members in readiness for 1960/61 season. The season began with 5 active members and conducted its first carnival on 7 January 1962. ​In 1961 Cape Paterson, due to the generosity Caltex (Australia) Pty Ltd, purchased its first surfboat (clinker) from the Lorne SLSC renamed it the Caltex Gippsland. Unfortunately it was wrecked in 1964. The bow was mounted and is now fastened to the clubhouse wall as a monument to Caltex and that historic craft. In the early years office bearers and members were restricted to local (Wonthaggi) area. This began to cause communication problems with State Centre and also limited membership. Some potential members were attracted to the board riding fraternity, also operating and administration problems became evident as Melbourne people who had holiday homes and joined the club could not hold office or participate in a lot of club activated due to committee meetings being held mid-week in Wonthaggi. 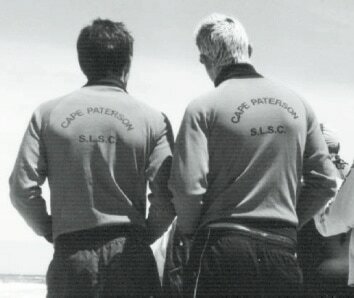 In 1963 Peter McGenniss, a former member of Point Leo, joined Cape Paterson and became assistant Gear Steward. 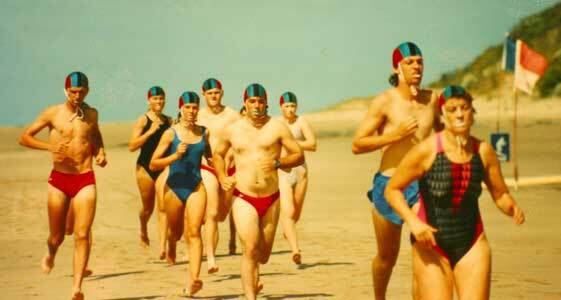 Having a strong personality, Peter persuaded the club to change their committee meetings to Sundays on the beach. This enabled non-office bearers to see how the club operated. The next year Peter became Secretary and set about training and teaching new office bearers surf life administration techniques. He also recruited and trained active members – resulting in 50/50 percentage of local and Melbourne members. In 1964 Ron Gilmour and Les Smith (second President) were elected the club’s first life members. The club submitted plans for a new two storey clubhouse in 1965, but due to a lot of red tape and wrangling with local authorities and Government Departments the progress of the plans were held up for two years. They were then held up another 12 months because of the ramifications of State Centre being formed into a Company. Finally in November 1968, the club was granted its approval to build the clubhouse, which was officially opened by the Mayor of Wonthaggi at the Victorian Titles head at Cape Paterson on 9 February 1969. The long delay of making application for and receiving approval to build the clubhouse caused and administrative upheaval and lowered the morale of many members. 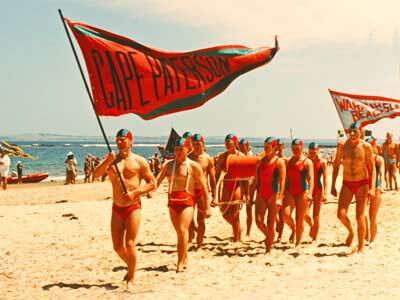 All of which seriously hindered the progress of the Cape Paterson Surf Life Saving Club. To raise the standard of fitness and to keep the interest of members, especially non-competitors, the club captain, Rod Rogers introduced a handicapped monthly medal competition in 1967/68. The following season this was modified to an iron-man type competition which proved to be very successful. 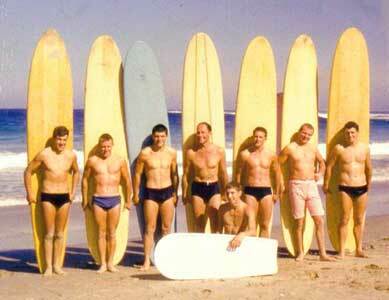 It not only keep members fit but increased the number of members who could skilfully handle a surf board. During these formative years a strong and active ladies auxiliary provided invaluable support in raising funds to purchase surf boats and other necessary lifesaving equipment, as well as catering for various functions. 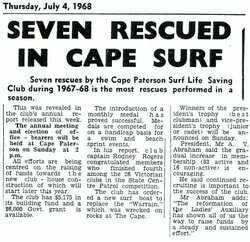 Without the cooperation and assistance of the Wonthaggi Royal Life Saving Club it would have been much more difficult to form and develop the Cape Paterson Surf Life Saving Club. ​Albert Abraham, who had succeeded Les Smith as President, led Cape Paterson into the seventies and, as with Frank Harvey and Jim McBain in their terms as President, experienced a severe shortage of funds to complete the building. It was not until the mid-seventies that their combined efforts and with assistance and advice from the Victorian State Centre, enabled the floors, interior walls and ceilings to be installed by Coldon Homes, who were most considerate in settlement of their account. Membership began to pick up in the late 70s after a few lack lustre years. The most turbulent period in the club’s history and that Cape Paterson Surf Life Saving Club survived is testimony to these leaders and their supporters’ integrity and determination. Club stalwart Norm Legge was elected a life member in 1973 and years later, after his death, a medal was decided upon, in his honour, to be awarded at the club committee’s discretion, to any club member who performed exceptional service in any one season, but not necessarily awarded each year. This has become a most prestigious award. John and Yvonne Cantwell, who had become prominent in the club’s administration in this period took Cape Paterson in to the eighties and during John’s term as president the club was incorporated in common with modern business practices. In 1980 the first three female lifesavers achieved their Bronze Medallions in the club. Cape Paterson members have been not only been competitive in carnivals, consistently finishing in the top group both in the District and State Patrol competitions, but through the quality of service they have provided on the beach to their local community. The diligence of the patrols has meant that there has never been a fatality at Cape Paterson Surf Beach. 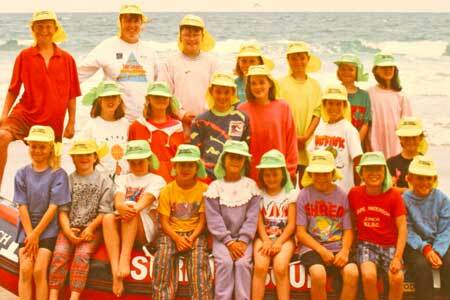 As well as regular patrols, the club has organized a Junior Surf Life Saving (Nippers) Program for 5-13 year olds for much of its history and has introduced many young people to the skills and enjoyment of the surf. A family orientated club with the Harvey, Legg, Cantwell, Donohue, Abraham, Fitzgerald, Rogers, Prendergast, Manns, Marangio and Phillips families prominent in its history and with some third generation members now in its ranks, Cape Paterson is poised to continue to carry out its duties to the community in making the beach safer and positively supporting the local community.